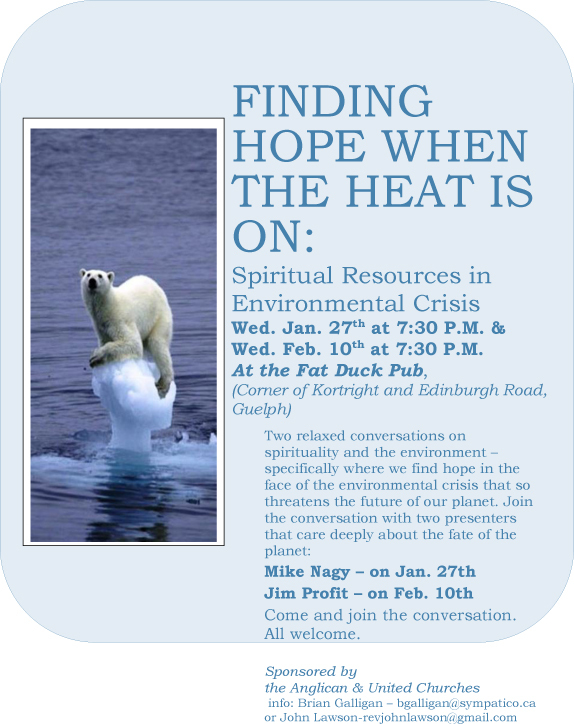 Relaxed conversations on spirituality and the environment taking place in one of Guelph’s best eateries, The Fat Duck Pub! Where can you find hope in the face of the environmental crisis that threatens the planet? Join the discussion with people that care deeply about the fate of our planet. Following Mike Nagy’s presentation on Wednesday, January 27 why not spend an evening with Father Jim Profit from the Ignatius Jesuit Centre on Wednesday, February 10? Relaxed conversations on spirituality and the environment. And, its all taking place in one of Guelph’s best eateries, The Fat Duck Pub!